Which Universities will shape the learning spaces of the future? Author Simon Paul AtkinsonPublished on October 5, 2011 April 23, 2015 Leave a comment on Which Universities will shape the learning spaces of the future? "In search of the virtual class: education in an information society" published in 1995 by John Tiffin and Lalita Rajasingham begins with a description of a girl climbing into her sensor suit and shooting off to a virtual waterfall for a geography lesson. Digital Immersion was the future. The description of the learning envisaged a different kind of learner. As the learner changes to take a significantly more determinant role in their own learning process, in a world in which Choice is the defining quality of the consumer and therefore the product, the model of our universities must look like the model of our students. Universities must accept that the very nature of the University will change as societal expectations of their function ( most evident in student expectations ) changes. Which Universities will be brave enough to shape the learning spaces of the future? Last month I wrote a short piece about the way the SOLE model might be used to reconceptualise the physical and virtual spaces in which learning will occur in the 21st Century. There are other models, my suggestion is simply that you need the model first, that a conceptual model of learning provides a useful mechanism to debate and design the spaces we intend for our learning. If we do not then we, Universities, will end up describing a 'what' we offer the student but not the 'why', and as we surely all recognise by now consumers don't buy what you make, they buy why you make it. "Give me an educational rationale for why my lecture theatre looks like this, why my VLE looks like this!" What does that mean in practice? 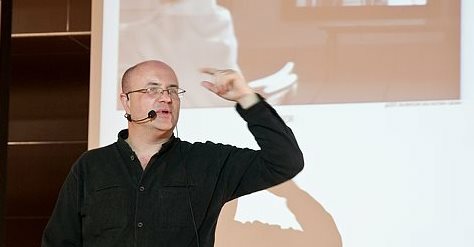 In 2009 I was fortunate enough to be invited to deliver the closing keynote at the Estonian e-Universities conference in Tartu, Estonia. I asked delegates to do a little foresight thinking with me, a little futurology. Not something particularly 'big' in the UK or New Zealand (where I worked a the time). In my scenario I described Trin, a girl born in 2009 in Estonia, and asked the audience to future-think with me what her educational life would be. I had several points I wanted to share, that the academic qualifications she would study in 18 years time most likely did not exist today, that her career choices were likely to be more complex and 'portfolio' driven than today, based on evidential skills not qualifications and so on. In amongst this discussion was the suggestion that the very future of the educational spaces she encountered would change. My suggestion was that Trin would go to a school in 2020s, when it suited her parents who blended home-schooling with community-schooling to fit with their family scenario. That the school itself was built into the fabric of the community, in buildings shared with other community services, post-office, library, social centre for the elderly. The extension of this sees Universities being porous knowledge mediators not guardians of the book-tower. Universities that used to shape our epistemological universe will do so again, but as our universe changes and expands, so must our universities. In the two years since 2009 I can see things already diverging from my future-think, but some things I'd suggest are still relevant and the SOLE model provides one way of interpreting and predicating this change. As we accord learners a more central role in the learning process, should we not be exploring spaces through the SOLE model, or something like it? Should we not be asking what spaces we need to engineer for students to help them fulfil the holistic experience the SOLE model represents? The universities that will shape the learning spaces of the future are those that are able to conceptualise, visualise, the world in which this future learner lives. The campus has had it's day. Previous article:There is no such thing as blended-learning. Next article:OER: the death of the solipsistic academic?